Another place that I noticed one day when we were biking up the big hill in Trondheim towards Bymarka was a huge outdoor museum. Behind a huge gate, which read "Trondelag Folkemuseum," were some cool looking old buildings and walking paths. I wondered what it was (obviously, some kind of museum), so when we got home from the bike trip, I googled it. What popped up was a link to the Sverresborg Trondelag Folkemuseum, a huge open-air museum that displayed almost 100 traditional Norwegian buildings. It was very reasonably priced for the student ticket, so we decided to go when it was sunny. A rich person's house from the early 1900s. We took off early from work today, since the afternoon turned out beautiful, and packed some food and water into our bags, and then hoped on our bikes. It was pretty hot out, so we wore our padded biking shorts for the ride (yeah! warm enough for shorts almost never happens here). We were hoping to make the 2pm tour that was advertised on the website as part of the admission. When we got there, the tour actually started at 2:30pm, so we had a little while to look around the museum before the tour. 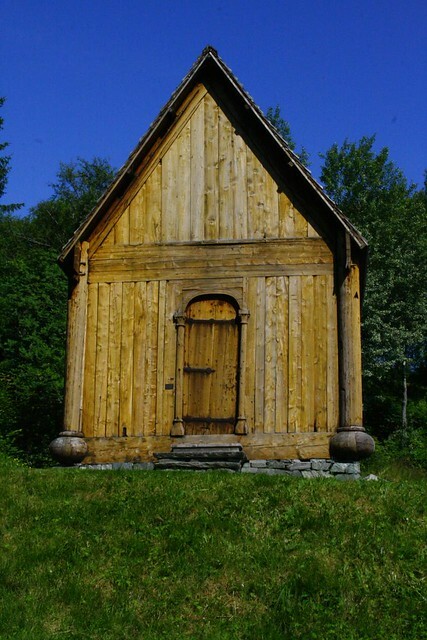 A real medieval stave church, from the 1100's! The closest thing to the place where the tour began was the 'old town.' 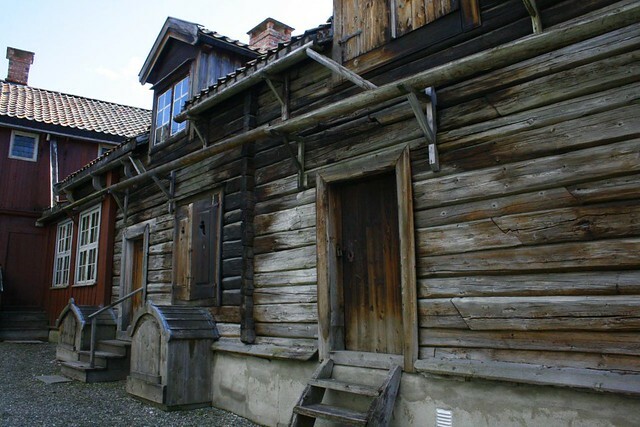 This was a reconstruction of original buildings into what a typical town would look like. Many of the buildings were touching each other, creating a long corridor in front of which was a cobblestone street. Houses looked very similar to the grocery store, the dentist, or the tavern, for example. 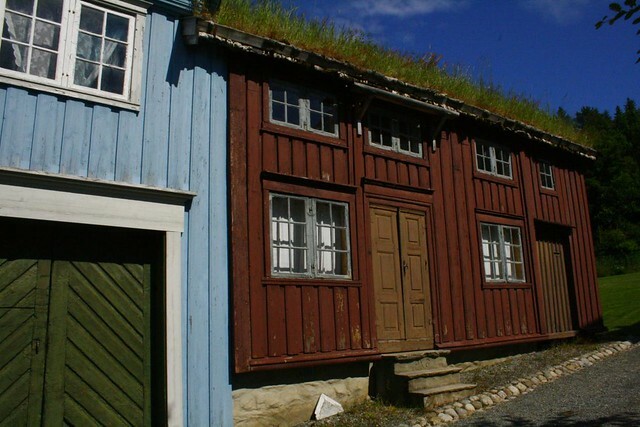 Many of the houses were made of painted wood with grass roofs. The buildings were very simple inside, and reminded me a lot of the ghost town buildings in the western US. 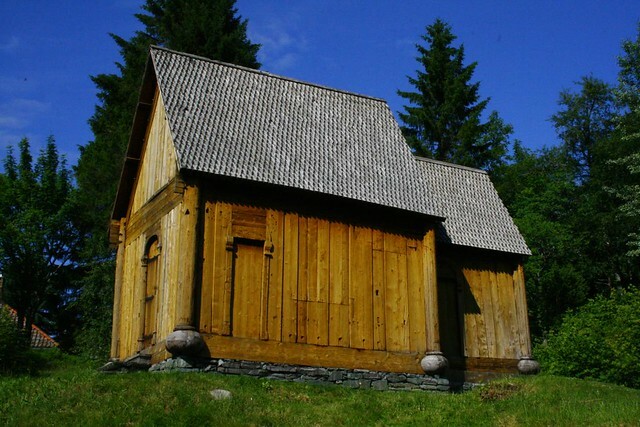 Side view of the medieval stave church. When the tour started, we were the only ones waiting! But as soon as the tour guide started walking away, more people joined us (this seems to happen a lot for us). The first stop on the tour took us to a medieval stave church. The church was from the 1100s, and it was all original. The wood has survived for so long because the people have used it constantly since then, and covered it in tar to keep it dry. The church itself was very small and had no windows! This was done on purpose because it was lit from inside with candles and that was part of the experience. There were no chairs, everybody just sat on the floor or stood for the entire church service. We got to go inside and it was really eerie but interesting! There are only 29 stave churches still left today. Most are very plain and simple like the one we saw, but there are a few that are crazy looking! Beer pitchers inside of a rich person's entertaining and dining hall building. Next we stopped at a small traditional farm. 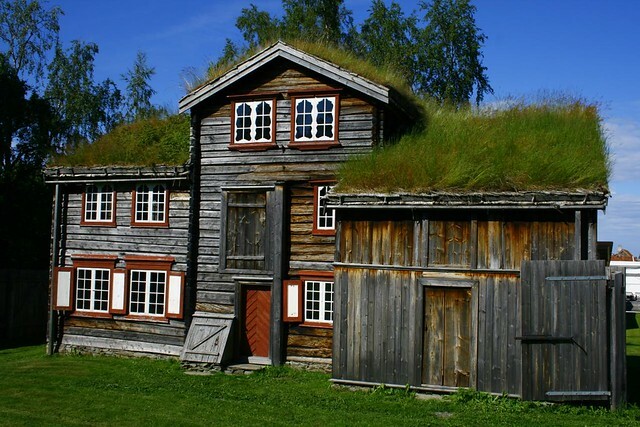 Those buildings were made of wood, like a log cabin, and had a grassy roof. The roof was made like that to insulate the building and also so that the snow would fall more evenly on the roof in winter. The roof is actually water tight, even though it is only made of wood and bark lining, with some thick branches that act as terracing, so the plants and dirt don't slide off the roof. Some of the buildings were very well camouflaged because of the green roof! 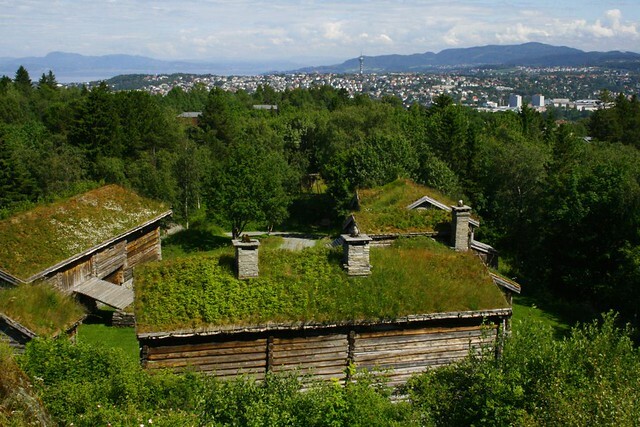 Part of a reconstructed farm, with the city of Trondheim in the background. The tour guide told us that the farm house was usually a two room cabin, unless the family was rich. One room was the main family's quarters, and the other room was for grandparents. Couples were usually married off as a political thing between families, not for love. People would try to have a lot of children so there were more people to work on the farm! They would eat porridge for three meals a day, supplemented by dairy, fish or fruit/veges in season. It was also very important to brew beer. We learned that it was written into Norwegian law that if you had over a certain amount of acreage (or something like that), you were required to brew beer by law. The Norwegians say "skal" instead of "cheers." Skal literally means bowl, and the saying is from the fact that the brewers would bring beer up from the basement in huge pitchers, and then pour the beer into even larger broad bowls on the table. People would pass the huge bowl and drink directly from it. The tour guide also told us why it is customary in many places to clink your glasses together when you say cheers or skal. That is a relict of times when people used to murder each other by poisoning the others' drink. Because of this, people would slam their drinks together so that some of the liquid from one person's drink would splash into the other's. That way, if you poisoned somebody's drink, you might end up poisoning yourself. It must of happened a lot because the tradition is still going strong! Old city streets as they would've looked in the early 1900s. The tour guide was really great, and she was a singer too. She would sing us old traditional folk songs. In another church that was more recent (not medieval) she sang us an old hymn. Then she told us that the women would have to sit on the north side of the church, and the men on the south side. The north side had no windows and was thought of as the evil side because evil came from the north. The women served as protection between the men's side and the evil north. The people didn't bother making windows on the north side because that's where the women sat. Isn't that crazy? Old city apartment houses from the early 1900s. We learned so much during the tour! She also told us how you would be able to tell if a person was rich or not by how they painted their house. Red paint was fairly easy and cheap to make, and it was partially made red by mixing in animal blood. White was the most expensive color to make and buy. So if you were rich, you painted your house white. If you were poor, it was red. 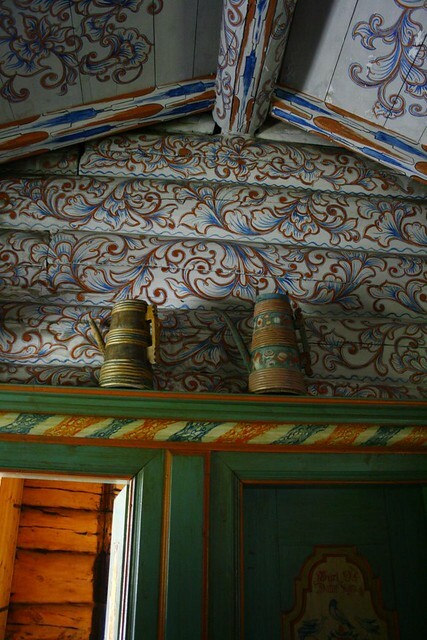 To this day, most of the norwegian houses that we saw in town or on road trips through the country are painted either red or white. I don't think it's a symbol of wealth anymore, but the traditional colors still are showing to this day! Inside the ski museum, we saw what looked like Romy's mom! One of the last things we saw as we went through the outdoor part of the museum was the Sami huts and the boathouse. The Sami huts were basically debris shelters with a wooden frame to keep the debris from falling in on itself and collapsing. The Samis made a winter hut and a summer hut. The winter one was small and cozy, easy to heat. The summer one was large and roomy. They store food in elevated shacks which were on stilts. This kept the mice and other rodents out because they couldn't climb the stilts. In the boathouse, we saw how they used to make buoys. They would wrap tree bark on itself until it formed a huge ball. Then they would wrap the ball with a tightly fitting net to keep it all together. It floats just like a modern day buoy and its totally natural. 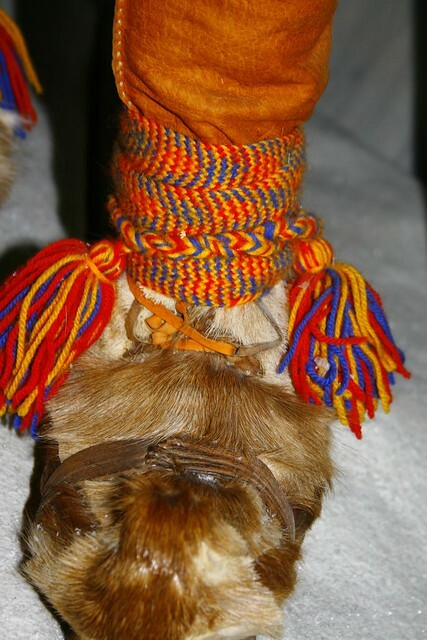 Who needs modern gaiters when you can have leather pants with colorful weaved things to keep the snow out of your animal hide ski boots? After we were done with the outdoor stuff, we went inside to the ski museum. Norwegians love to ski, but many don't ski downhill, they ski cross country style. It was normal, back in the days, to make your own pair of wooden skis every season. It would take a person about 2 days to make a pair. Each region in the country had a unique way of making skis, based on the predominant snow conditions. They usually had only one large pole instead of two. They would ski with animal hide or skin on the bottom of the skis to provide traction when going uphill. 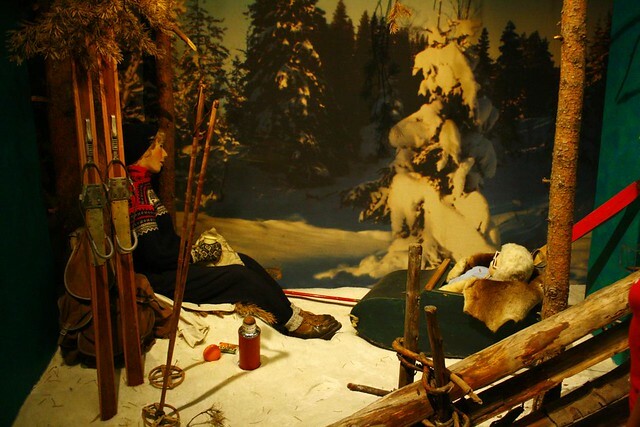 It also was much quieter, so the Norwegians would hunt with skins on. Snow shoes were relatively unknown and unused, surprisingly. The museum said that the only use for a snow shoe was for hunters who would have a snow-shoe type thing on one foot, and a ski on the other. They would do a glide and hop motion to get to their prey much quicker than if they were on two skis. That is so interesting! 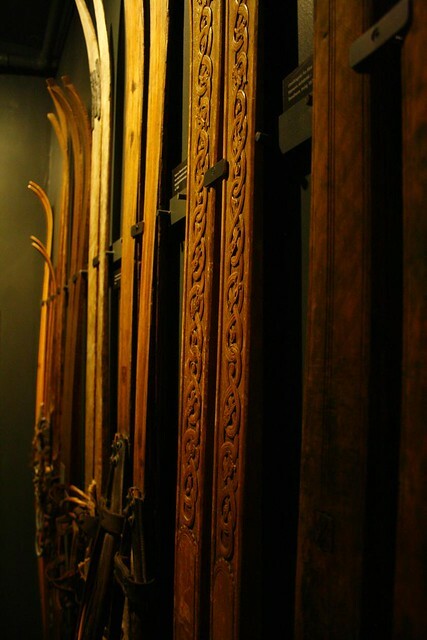 Hand carved wooden cross-country skis from Norway. At the museum, they also showed the dress that people wore while skiing, from ancient times to modern times. At first it was very caveman-like, with thick skins covering people's bodies. Then the clothes became sportier with weaved wool clothes and leather pants. Skiing for a majority in Norwegian history was not a sport. It was another means of transportation, like walking, when there was snow on the ground. In the early and mid 1900s, men began to go skiing as a social outing, and it slowly evolved just recently into a sport. Women were not allowed, and it also wasn't proper for women to dress in sportier more comfortable clothes to go skiing. Eventually that changed and now skiing is something completely different. Near the exit of the museum, it said that now not even half of Norwegian children own a pair of skis, or even know how to ski! What a change in just 100 years!